July, 2007--Super-mega-slip-and-slides are so cool. I'm pretty sure K was thinking, "OMG what in the HELLO KITTY was that, and can I do it again?!" Super-mega-slip-and-slides are so cool. I'm loving those pictures of the chubby baby legs and 'Oh My Goodness' face! 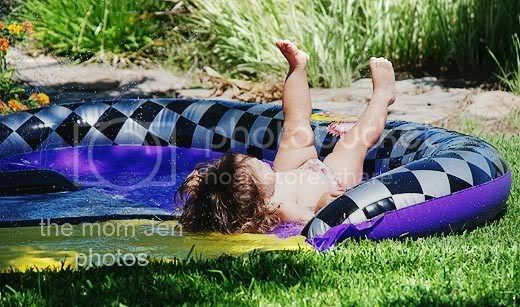 That does look like lots of fun .. now I want a slip and slide! That first picture is hysterical!! now doesn't that look like fun?!? that looks so fun! i cant wait for summer!!! So what did you do? Toss her down bowling ball style?? Looks like fun!! Love the expression on her face afterward. I LOVE the look on her face in the second one! lol She's just too adorable! OMG! That was THE best!!! What a GREAT pic! Love it! Those chubby little legs up in the air are killing me!! Oh my gosh... That makes me wish for summer!! 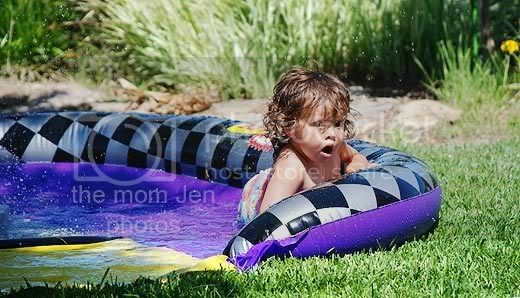 OMG - I LOVE slip'n'slides! There was nothing better when I was kid. Can't wait 'til my little buggers are old enough to use them. Look at those awesome leg rolls! So stinkin' cute. Have to say though, I may have hit that pose on a wet kitchen floor just recently. Oh how CUTE! I love her chubby little legs over her head - truly priceless! What in the "Hello Kitty"... too funny! Cutie she is! Oh how FUN! The look on her face in the second picture is priceless! 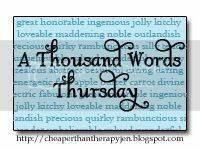 :) Happy ATWT! Awwww-look at those little legs, too cute!! I'm LOVIN those pictures! I got one at the end of the season last year for just a few dollars and cant wait to see how my little man does with it! So fun! I might get one for our house this summer. I can't wait!! great shots can't wait until it is nice enough to get the pool out! i love the look on her face! super mega cute! Oh my goodness! I love it! Her little legs in the air..the look on her face! Priceless. ROFL!!! Those pictures are priceless (and I love Hello Kitty - LOL!!!) The look on her face is hysterical!!! OMG! The rolls on her thighs...girl are you feeding her "arroz con pollo & black beans?" God, I would just smush her, and pinch her her and nibble on those drumsticks! weee, that does look fun! love her face! Wow, what a ride. A Mom, that is cold water. Thanks for the warning.LOL thanks for sharing that was really cute. Those are some awesome action shots...I'm sure she flew by your camera on that thing - they are fast! Too cute. Thanks for making me (even more) anxious for summer weather. oh my gosh! that looks like SOO much fun! OMG will you just look at those yummy legs! So adorable! Looks like she's having a blast...bring on summer! Oh.....I love those legs! I don't love them on me, but on her they are adorable! I love the expression on her face in the 2nd picture!! "What in the Hellokitty was that"
Oh, I love that line!!!!!!!! GREAT pix as usual jen...one of these days i am gonna get with the program and join your TWT! Super-mega-slip-and-slides are the definition of cool! I love the expression on her face, looks like it blew her mind. I love the expression on her face. Priceless! What in the HELLO Kitty?? OK, I am totally incorporating that into my everyday speech...that one is good...and PS, so were the pics!!! The look on her face is priceless like "Whoa!" and her chubby baby legs are adorable. She's killing me with the thighs, so cute! I think I'll introduce 3 boys to a s&s this summer. mine is up as well! That is a funny set of pictures! Looks like fun. Those pictures are so great. She is adorable. My kids are big now but they still love slip and slides. That picture is priceless. How much fun is that? I love the 'what in the Hello Kitty'!! I can't wait for the warm weather to arrive. I was guffawing at the What in the Hello Kitty quote. Hilarious. I just want to nibble on those plumpy little baby legs! Makes me miss my kids when they were little! Man, I used to love the Slip 'N Slide when I was a kid! Scared you to death and was the most fun you ever had, all at the same time. These made me smile so big and I just wanna squeeze those chunky thighs. Although they are probably gone now, huh? Ohmagosh. This makes me giggle..."What the HELLO KITTY was that?" LOL. Those pictures really do say a lot. She so cute! OH my goodness the thigh rolls in the first picture are priceless! Amazing how it is so cute when you are a child then you grow up and wellllll NOT so cute then!! EEEP! Look at her chubby little thighs! SO FREAKING CUTE! "What in the Hello Kitty..." That's hilarious, Jen. Love the look of shock on her face. Way cute. Oh, I cannot even handle the thighs! I need to squeeze those legs!! I like these pics! You always get such great shots.